"We have no hesitation in wholeheartedly recommending Stephen for decorating work. 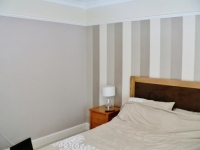 Stephen completed some extensive redecoration to our main bedroom. This involved preparing the walls, sanding and filling in holes, papering, painting walls and repainting woodwork to dado rail and skirting. 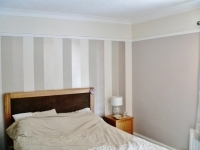 Not only was the quote very reasonable for the hard work involved, but Stephen completed the work to the highest of standards. He was on time, thorough, clean and polite at all times. 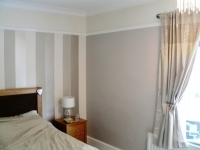 His hanging of wallpaper is some of the best that we have seen and paintwork spot on. Stephen did exactly what he said he would do, and did it in the time he said he would. He has proved to be a true professional both in skills and in attitude and we were lucky to find him. We have no hestitation in recommending Stephen to anyone and we will be booking him again when we have works of any type to be done." This was one of my first wallpapering jobs and I am very pleased with the outcome and glad to hear the Morgan's feel the same.